A liveaboard Cruise on the Roatan Aggressor is the perfect way to experience the best diving in the Bay Islands od Honduras. 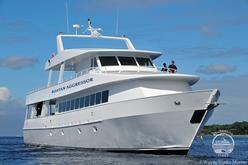 This 35m long vessel comfortably accommodates 18 guests across 1 Master stateroom and 8 Deluxe Stateroom. 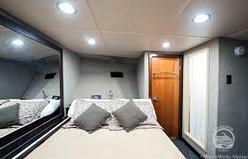 The deluxe cabins offer a double bed on the lower level and a single bed on the upper level. The Master stateroom offers a Queen bed. 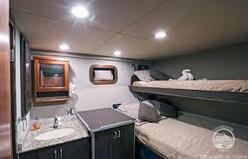 All staterooms have climate controls, private bathrooms and showersas well as 110 Volt US style power sockets. The Roatan Aggressor features a roomy, air conditioned salon and dining area, sun deck complete with a hot tub, lounge and deck chairs, stereo (has an IPod plug-in), shaded wet bar and grill, a complete photo center with a digital video and still photo editing computers. Diving amenities include Nitrox, individual dive lockers, camera table with low-pressure air hoses, and two hot, fresh water showers on the dive platform. 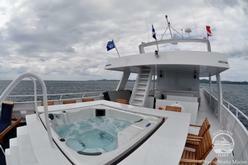 The yacht offers up to five dives per day (2 on the last day) including night dives. There is ample storage space for your diving equipment in your personal locker. 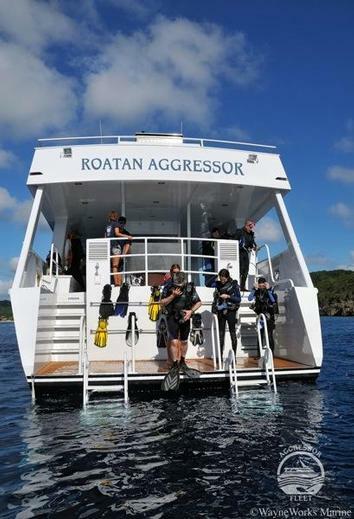 The Roatan Aggressor provides 80 cubic ft. tanks, weight belts and weights. The stern and platform area is very spacious. The boarding ladders were designed for convenience to allow divers easy entries and exits. Enjoy fresh water showers on the back deck after your dives and dry off with a warm towel. All dives are conducted from the mothership. The menu onboard is varied and plentiful, with fresh local fruits and veggies, island seafood, and local grown meats serving Caribbean and American feasts, barbecues and local cuisine. If you have any special dietary restrictions, please be sure these are noted when you book. You will awaken to fresh fruits, local specialties, hot entrees, cereals and juices. 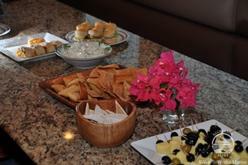 Lunches are buffet-style, featuring hot soups, homemade breads, salads and sandwiches and/or entrees. Chef prepared dinners are seated and served each evening including: salads, vegetables, fresh local seafood, beef or chicken with fresh homemade desserts. 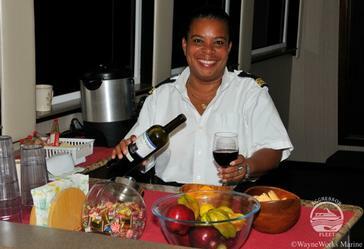 The Roatan Aggressor’s selection includes fruit juices, soft drinks, iced water, iced tea, coffee, and a limited selection of local beer and wine, which are complimentary. Note: Dinner is not served on tha last night of the trip. This is the only meal not included on the cruise. Romeo’s Restaurant at the dock is an island favorite and there are many local restaurants within a short taxi ride from the yacht. 5 full days of diving (up to 4 or 5 dives per day, including night dives) plus one or two dives on the last day. Please note: A port and national park fee of US$110 (7 nights) is not included in the package price and will be collected on board. Please note: Dinner on the last night is not included but guests will be given guidance for good local restaurants.